Registration: Sorry, public registration for this event has been closed. . This month's luncheon will be all about "Following Your American Dreams." Do you spend your time thinking of pursuing your dream career, traveling to that bucket list destination or volunteering your time and talents making a difference in your community? 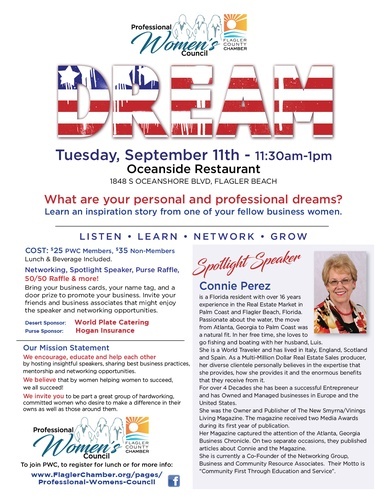 Whether personal or professional dreams, get inspired at the Professional Women?s Council luncheon featuring guest speaker Connie Perez, a real estate professional, world traveler, entrepreneur and outdoor enthusiast who will share her own experiences, so you can take steps to fulfill your dreams! Planning to attend? RSVPs are required by September 7. Connie Perez is a Florida resident with more than 16 years experience in the real estate market in Palm Coast and Flagler Beach, Florida. Passionate about the water, the move from Atlanta, Georgia to Palm Coast was a natural fit. In her free time, Connie loves to go fishing and boating with her husband, Luis. Connie is a world traveler and has lived in Italy, England, Scotland and Spain. As a multi-million dollar real estate sales producer, her diverse clientele personally believes in the expertise that she provides, how she provides it and the enormous benefits that they receive from it. For more than four decades, Connie has been a successful entrepreneur and has owned and managed businesses in Europe and the United States. The English Magazine, Roquetta, published her gardening Page, for their readers in Spain. She was the owner/publisher of The New Smyrna/Vinings Living Magazine. The magazine received two media awards in its first year of publication. Her magazine captured the attention of the Atlanta, Georgia Business Chronicle which published articles about Connie and her magazine. She is the co-founder of the Networking Group, Business and Community Resource Associates. Their moto is ?Community First Through Education and Service.? PWC sells tickets for $5. The winner receives half of the amount collected and the remainder goes to support the Grant Program. Grant Program: Each PWC member (minimum 3 months and in good standing) can apply for a business grant of up to $500. Grants are awarded annually. For an application, contact Colleen Cline, PWC Chair. Want to be a Spotlight Speaker? For $75, members have the opportunity to promote their business in front of 70-100 people through a dedicated 5 minute presentation as well as featured on PWC's website and weekly email. You are provided a display table at the front of the room to use for products and other materials that represent your business. Only at this time are you able to distribute your company materials on all of the tables. For an application, contact Colleen Cline, PWC Chair.